Koratala Siva directorial Telugu movie Srimanthudu that was released on 7 August 2015 has already completed the journey of one month at box office. 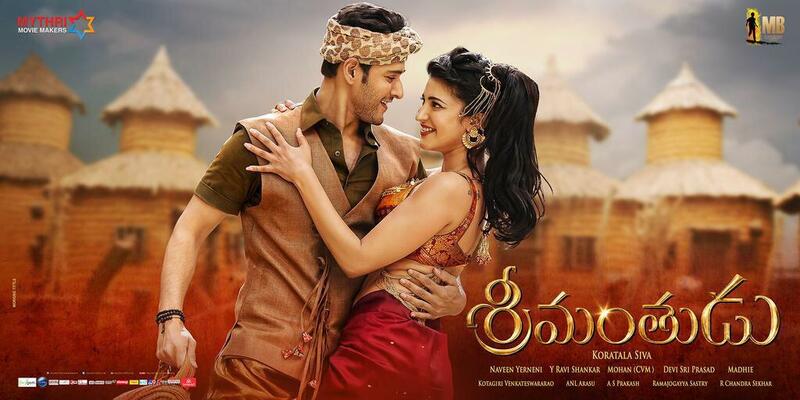 The Mahesh Babu & Shruti Haasan starrer drama movie is still soaring high on craze and collecting decent figures. It has done the business of approximately 172 crores at Indian box office in one month. Srimanthudu was released on 2000 screens worldwide and after a month still running smoothly in South India. Lead star Mahesh Babu is one of the most favorite actors in Tollywood and that is the reason behind huge hype of the movie before its release. After release, in first week the movie was successfully replaced the biggest blockbuster Baahubali that was running in theaters from 10th of July. Srimanthudu was received overwhelmed response from audience across the globe and was crossed the mark of 100 crores at worldwide box office in just 6 days. In its dominated regions such as Nizam, Srimanthudu was registered the collection of 12 crores in first 4 days and acquired second position after Baahubali that was collected 16.40 crores from there. Even after having Tamil movies in competition, the movie has performed so well in Chennai and nearby regions. On 21st August, Ravi Teja starrer Kick 2 was released on box office with good hype, but didn’t succeed in performing impressively in front of 2 weeks old Srimanthudu. But now after a month, due to release of new movies – ‘Bhale Bhale Magadivoy‘, ‘Dynamite‘ and ‘Jayasurya‘, all three previous releases Baahubali, Srimanthudu & Kick 2 are facing heavy loss in their business.